Let your customers rate their car rental experience. Gain consumer confidence for your services. Submit a short form on the Agency Signup page, to get the Renter Rated Program onto your website. Instant customer feedback. 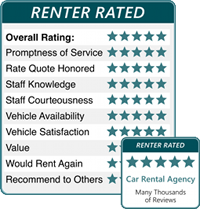 The car rental agency standard for collecting and presenting real customer rental experiences. Renter Rated is a Program developed by ExpressITech.com that provides your renters with the opportunity to share their rental experiences. At the end of their rental, renters are encouraged to rate your agency based on 9 criteria. All renters’ ratings are tallied – the more ratings your agency has, the more reliable the star rating value you will have. Categories of service can have ratings up to 5 stars (exceptional). Consumer Confidence: It is important that new renters have the opportunity to know about your company before committing to a rental. If they see that past customers had a great rental experience with your agency, they will be most likely to go ahead and book with you. Business Metrics: Your agency may get fantastic ratings on some criteria while only barely passing others. This is a great tool for you to use to see where you are thriving and conversely, where you need to make changes. Customers are not shy – and since the Renter Rated Program allows some anonymity, renters will be inclined to be truthful in their ratings. This metric can only help your agency grow. Log in and create a password. How to place the Renter Rated badge on your website. How to see renter comments, and create a reply if you wish. All of the Ratings charts and other materials described in "What Do I Get" will soon be available. They complete a reservation with one of your agency's vehicles. Based on Renter and Reservation information you submit to EIT, we send out Invitations for Renters to participate in a quick survey or review, after the drop-off date. The renters will complete a short survey. It only takes a minute to enter the 10 category ratings into the check boxes provided. They are also asked to leave a short text review or comment. We hope they will appreciate the chance to share their rental experience. The system has been designed so that it only takes minimal information from the renter – this will allow them to feel secure when leaving their comments. The required information (name and email address) is needed so that the system will be able to contact the renter at the completion of the rental. Each rental also has it’s own unique identifier (i.e. reservation number) – this allows our company to track if renters are return customers. Be advised that the email address is one-way encrypted, so we are only able to contact them one time. You will be able to post your agency rating at your site for future renters to see. We provide a small graphic or Renter Ratin badge for you to add to your site, like the one seen above. When a renter clicks on the Rating badge, more details will be shown. Your agency’s overall star rating, created from past survey results, like the chart shown at the top of this page, which tells you about service in every category. 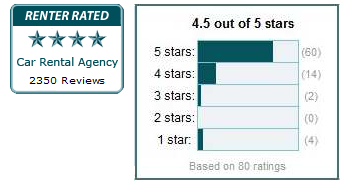 The total number of ratings your agency has – this is displayed as a chart that shows how many of each star-ratings are submitted. It tells you if service is consistent or varies a lot. Results are updated in real time – renters will be able to see how fantastic your agency is, after other renters leave reviews and comments. In addition to this, we make sure renters stay on your site, even if they want more information on the Renter Rated Program. We provide a link to the Renter Rated Site that pops up as a new window or tab. When the renter leaves that web location, they are still on your website.